No matter what, the show is going in some very different directions. The Nazi’s from Earth-X have been defeated, Barry and Iris have finally gotten married, and now all Team Flash has to do is defeat a guy with a super-brain. Oh, and Barry’s in jail for the murder of Clifford DeVoe. After a dour and somewhat derivative Season 3, The Flash Season 4 has brought with it an attempt at a more lighthearted tone. But as Clifford DeVoe, aka The Thinker, emerged as the season’s real Big Bad, things took a serious and much more interesting turn. The mid-season finale “Don’t Run” revealed that The Thinker’s plan was to transfer his super-brain into the body of the new telepathic meta-human. The DeVoes were then able to use Clifford’s old body as a trap to frame Barry for his murder. With Barry on trial for murdering a man that had a restraining order against him to begin with, things are looking pretty dire. So where will the show go from here? Actor Wentworth Miller, who’s played both versions of Leonard Snart, recently returned to the Arrowverse as “Leo” Snart, aka Citizen Cold, from Earth-X. He briefly joined the Legends of Tomorrow for their mid-season finale, and at German Comic Con earlier this December, revealed that he’ll be filming one final episode of The Flash before his contract is up. We don’t know when this particular episode might air, but there should be 14 episodes left in Season 4. 'The Flash' has a Kid Flash problem. The Flash has a Kid Flash problem, which is that sadly Keiynan Lonsdale’s Wally West has been sidelined for much of Season 4. Rumors say that it has a lot to do with budgetary concerns — rendering two speedsters zipping around is — I don’t know — twice as expensive as one? Pretty much everybody on the internet has already written their think piece about why Wally should join the Legends, but there’s really never been a better time. Recently, Professor Martin Stein died, which in turn eliminated Firestorm and ultimately led to Jefferson Jackson leaving the Waverider. The Legends of Tomorrow are two men down and could use another meta-human in their ranks. What’s more? Kid Flash helped out on the season premiere of Legends of Tomorrow in a cool scene that makes this feel oh-so-possible. Reverse-Flash survived somehow and for some reason wears a Wells face again. One big surprised offered by the “Crisis on Earth-X” event was that the original Reverse-Flash lived somehow. The whole thing was barely explained and for some reason, he appeared with Harrison Wells’ face like he did back in Season 1, and he was also working with the Nazi doppelgängers from Earth-X. In the truly insane final battle between all the heroes and villains, Barry contemplated killing him but let him go. Barry told him to “get out of here,” to which he replied, “I wonder what face I’ll be wearing next time we meet.” The Reverse-Flash might not be back this season, but his return might be just the spectacle we need from the Season 4 finale. Barry and Iris are officially married now, so the next step in their relationship might be an expected one. More than three seasons later, we finally have the long-prophesized “Iris West-Allen” with the wedding of Barry and Iris. Once they get this whole Thinker business sorted out, what’s next for the West-Allen household? What’s more is that when Barry came out of the Speed Force in the Season 4 premiere all discombobulated, he said, “We’re going to need more diapers.” Now, this sounds exactly like something a father might say if he found out he was having twins, doubly so if they wind up being born around the same time as Cecille and Joe’s baby. Could that be Iris and Barry's daughter from the future? “Crisis on Earth-X” left us all with one glaring, dangling plot thread: Who the hell was that waitress that had a weird encounter with Barry moments before the wedding started? The waitress walked up and offered Barry some water and made awkward small talk about getting married before saying, “I’m really excited to be here … I mean — at a wedding!” She also said, “I feel like this will be one for the ages. I’m really happy I got to see it.” This spurs Barry to ask, “Have we met?” She assures him that she’s a “total stranger” and grabs his arm to wish him luck before disappearing. Everything about this exchange just screams time traveler meeting their parent, especially her unnatural sentimentality regarding the whole thing. Since when do waitresses pop up in churches to pass out water? And why else would she know to show up before the Nazis crashed the party? We’d bet money that she’s a time traveler that knows Barry or his descendants in the future. Futhermore, she’s probably Dawn Allen. Soon enough, everybody might know the truth. The Flash seems to genuinely be leading to Barry’s secret identify being outed to the masses. Over on Arrow they’ve been running through a similar plot thread with Oliver being outed as the Green Arrow as the team jumped through various hoops to try proving otherwise. Savitar let slip a detail about Barry's future. Honestly, Barry is kind of dumb to have forgotten this one. In the Season 3 finale, Savitar-Barry strolled through S.T.A.R. Labs and mentioned remembering how they built the “neural inhibitor to use against DeVoe.” This was the second namedrop of “DeVoe” with the first coming from Abra Kadabra earlier in Season 3 on a list of Barry’s greatest enemies. Well, on Supergirl’s Earth-38 in Supergirl Season 1, they used a “neural inhibitor” against the powerful psychic alien Jemm. Maybe they’ll adapt that technology to use against DeVoe? Now this one’s a bit out-there, but there’s a precedent in it from the comics. In DC Comics, the Reverse-Flash — who also goes by “Professor Zoom,” by the way — killed Iris. Years later, he also tried to kill Barry’s new fiancée, Fiona Webb. Barry seemingly snapped Thawne’s neck and The Flash was tried for the murder. After a lot of comic book hoopla, he fled to the future and faced Abra Kadabra — but he also encountered a reincarnated Iris West. The two marry and have children in the 30th century, and this is when the Tornado Twins are born. 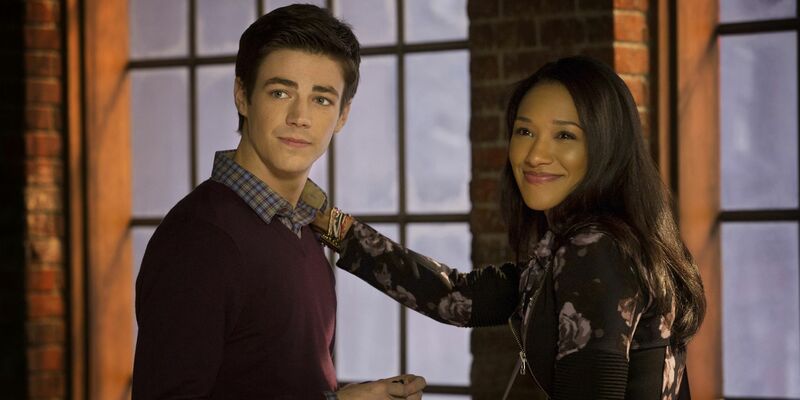 What if, for one reason or another, Barry and Iris flee to the future as the big finale to Season 4? And that’s where they have their children? The Flash returns to The CW on Tuesday, January 16 at 8 p.m. Eastern.